2. Open clams with a clam knife, saving the juice in a bowl. Add white wine and lemon juice to the bowl. Pour the liquid over the clams. 3. Mix the breadcrumbs with salt, pepper, cayenne, chives, and parsley. 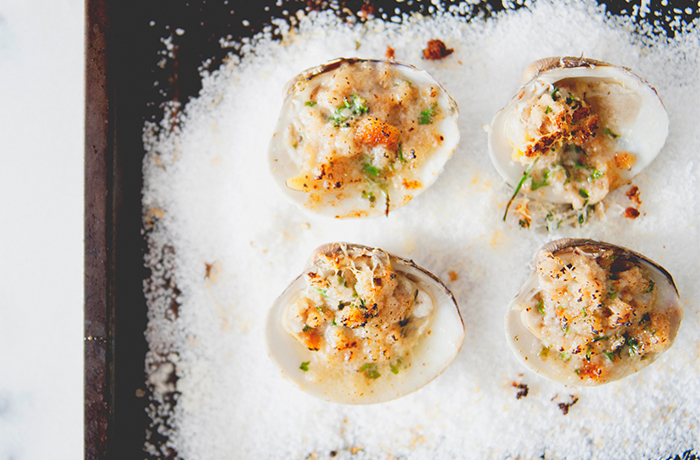 Sprinkle over the clams. 4. Top with grated Parmesan, and drizzle with melted butter. 5. Broil until breadcrumbs are golden-brown. Serve, and enjoy! 2015 Più Gioia Pinot Grigio. Our newest vintage of Più Gioia delivers crisp Pinot Grigio delight with every drop. Pair this elegant, well-balanced example of an everyday white with shellfish and fresh summer salads.